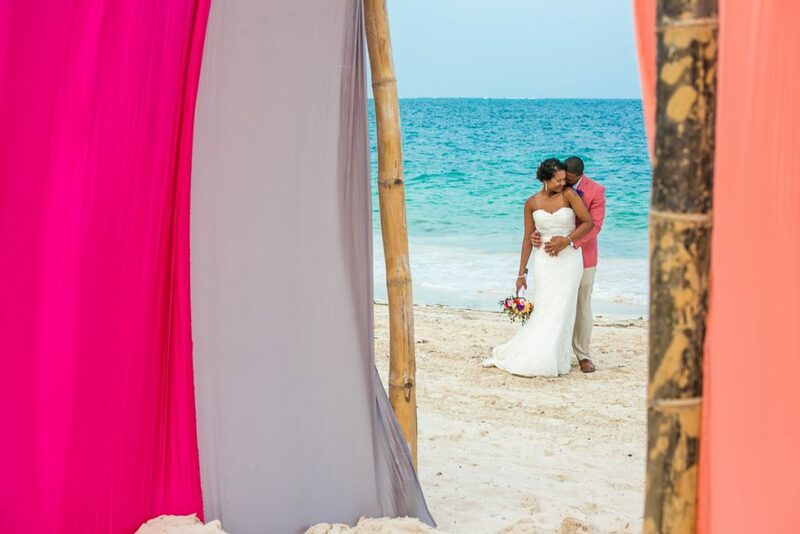 Ashley & Che are Fun In The Sun Weddings’ newest newlyweds! The bride had a vision for a classy boho beach wedding at Now Sapphire that she wasn’t sure would translate, but with help from her mom and her wedding coordinator, it ended up exceeding their expectations. Chalk up another victory for Match.com! Ashley started an account hoping to meet the love of her life. Che was the first one to send her a message, and after their first date, she deleted her profile. They decided on an intimate beach wedding in Riviera Maya with their closest friends and family because they wanted to celebrate for more than just one day. They wanted to get everyone in the same place at the same time to have a vacation, and they chose the Now Sapphire Riviera Cancun as that venue. The most special person in attendance was Che’s daughter from a previous relationship, who has become the center of Ashley’s world. It was important to Ashley that she know she was marrying both her and her dad. So, on the wedding day, they presented her with a special necklace as a symbol of their love for her. Ashley envisioned a classy boho beach wedding. They had an unplugged wedding ceremony awash with colors of coral and gold with green and purple accents. She wanted a natural, laid-back feel, and she was able to accomplish that by bringing all of her own beach wedding decor with her. They decorated the open air reception space with candles in geometric lanterns, strings of bistro lights, and wooden tables with bamboo chairs. She also spray painted the lantern centerpieces as one of the many DIY projects that went into making her wedding day perfect. Ashley’s favorite moment from her wedding day was their exchange of vows. She and Che wrote their own and touched not only each other but also all of their guests. And what is her one piece of advice for all the brides-to-be who are getting married on the beach in Mexico? Listen to your heart and your gut. It’s your big day, don’t let other people’s opinions lead you away from what it is you really want. Ashley & Che, we wish you and your adorable little girl nothing but happiness as you start your new life together as a family. It has been a true pleasure working with you. Congratulations! Want to know more about the Now Sapphire resort? Read unbiased reviews on Tripadvisor here. You guys have been incredibly wonderful to work with - thank you thank you thank you!